What better way to kick off Conan's on-location shows than a Mad Max: Fury Road homage as he takes his band and Andy Richter to the epicenter of pop culture this week, San Diego Comic-Con. 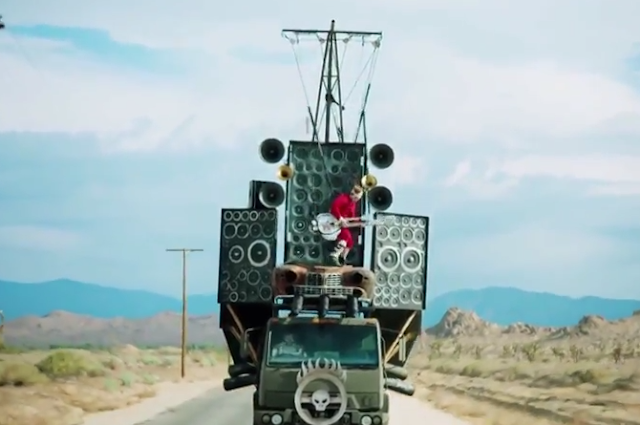 Strapped to the top of a truck playing guitar surrounded by giant speakers, Conan O'Brien recreates one of the wildest elements of the George Miller action extravaganza as the Doof Warrior. Catch Conan this week for guests from The Walking Dead, Game of Thrones and Mockingjay. Check your local listings for showings on TBS and more at the official website for TeamCoco.